I have been doing so much performing elsewhere that it is a real treat to perform in my hometown of Kalamazoo. 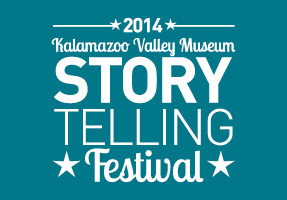 I am thrilled to be part of the great line up for the 2nd Annual Storytelling Festival: One World, Many Stories at the Kalamazoo Valley Museum. I will be performing songs and stories for a family audience Saturday, February 1st from 1-1:45. I’ll be sharing a mix of personal narrative, traditional tales and original songs. My good friend, and fabulous storyteller, Yvonne Healy is on from 12-12:45. Come on down! This entry was posted in Events, News, Storytelling by Allison Downey. Bookmark the permalink.